Elémentaire TV Episode 14: N – Nouveau. Potato Rusti & Eggs Gruyere! By John_Hamilton on January 22, 2014, 6:43 pm Comments Off on Elémentaire TV Episode 14: N – Nouveau. Potato Rusti & Eggs Gruyere! Elémentaire TV…In this episode of Elémentaire TV, Dave and Jenny make a potato rosti and eggs Gruyere. Elémentaire is the creation of two professional cooks dedicated to helping take the mystery out of making delicious meals from scratch. 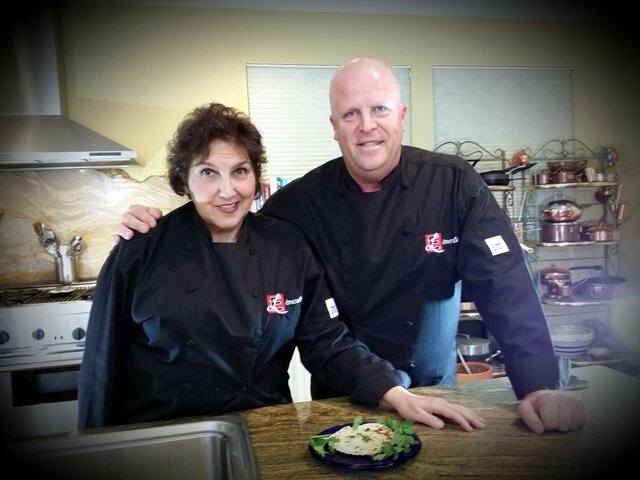 Our goal is to educate through the use of culinary terms and techniques and also inspire, through the use of the freshest seasonal ingredients, all who watch to make their own meals to enjoy at home. Peel the potatoes and grate them, using the large holes of a hand grater or a food processor. Put the potatoes in a large bowl, add the salt and pepper to your preference, and toss to coat thoroughly. Let the potatoes rest for at least 5 minutes, and then, working with a fistful at a time, squeeze as much liquid as possible out of them and transfer to a second bowl. To make one large rösti—Heat a heavy-based skillet that measures about 8 inches across the base over medium-high heat. Add the oil (it should come to a depth of about 1/8 inch; add more if-necessary.) When the oil begins to ripple and quiverp slightly, test it by dropping in a potato shred—it should sizzle enthusiastically. If not, wait a few more seconds. When the temperature is right, take a fistful of potatoes, wring it out once more, and let it fall loosely from your fingers into the center of the pan. Fill the pan gradually. Adding just a small amount at a time makes it easier to get an even layer. Working quickly, repeat until you’ve got enough potatoes in the pan to cover the bottom. With a fork, gently spread out the shreds of potato to make a layer about 1/2 inch thick, trying to distribute them evenly, avoiding dense or thin patches. Clean up the edges with a small spatula pushing back any shreds to make a neat circle.Adjust the heat so that you hear a lively sizzle but the bottom isn’t browning too rapidly. Cook until the underside is a deep golden brown and the potatoes on the top are starting to look translucent, 12 to 16 minutes. Carefully slide the rösti out of the pan onto a dinner plate, it should be golden brown on the bottom and return the pan to the heat. Put another plate on top of the rösti and, holding tightly, flip the plates over. Add more oil to pan if needed and slide the inverted rösti back into the pan and continue cooking until the new bottom is browned and the potatoes feel really tender in the middle when poked with a knife about 6 to 8 minutes. Slide the rösti onto a rack to hold it for a few minutes and let excess oil drain. Blot the top with a paper towel to remove any excess oil.